The grace of sandhill cranes draws our attention when we see them in the marshes, meadows, and fields across northern Utah. As one of the tallest birds in the state, the sandhill crane is hard to miss. They’ll glide low over farm fields, with their large slate-grey bodies and red caps making them difficult to mistake with any other bird. 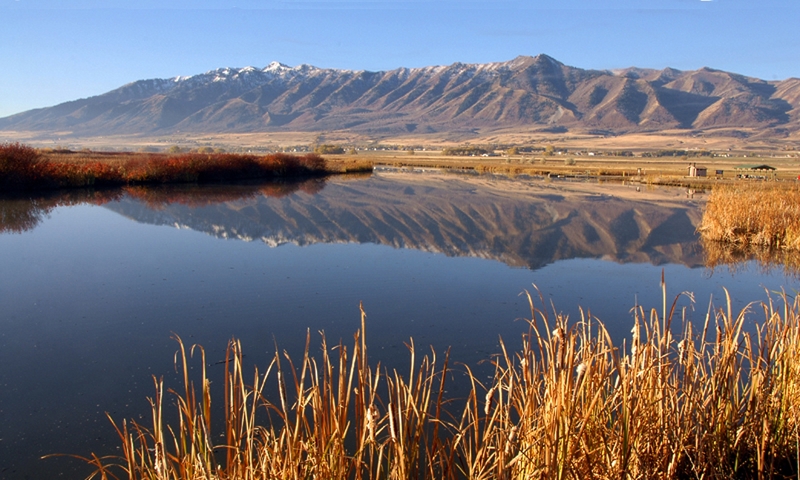 Northern Utah is near the lower end of the sandhill crane’s breeding range, so we’re fortunate to see them. 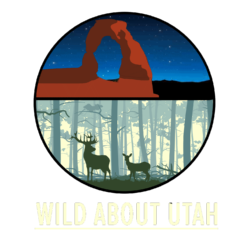 They’ll arrive to Utah beginning in March, and stay for the summer breeding season. 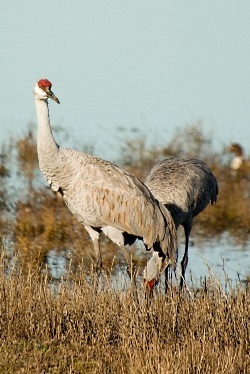 Sandhill cranes develop pair bonds for life, and their choice in mates is influenced by elaborate courtship dances. Crane dances are like awkward avian ballet, with an assortment of bows, flapping wings, and leaps into the air with wings outstretched. At times, sticks or plants are grasped with their long, dagger-like bills and tossed into the air. At up to four feet tall with a wingspan of five feet, the sandhill crane as it dances is quite a sight to see! Sandhill cranes are often heard before they’re seen. Their loud, rolling trumpets fill the air, even for a couple miles. Males and females call in unison, as a loud duet that helps reinforce their pair bond. Once a suitable nest location is found on the ground or on shallow water, both the male and female toss plant material over their shoulders to build their large nest. As spring now fades to summer, sandhill cranes can be seen strolling through farm fields with their young colts, encouraging them to feed, and protecting them from predators. While the dance of the sandhill cranes has mostly ended, their elegance hangs in our memory until next year. Leopold, A. 1986. A Sand County Almanac. Ballantine Books.